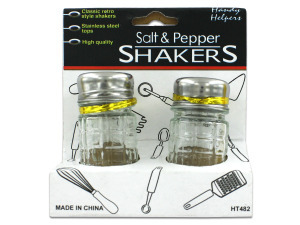 Add an unexpected element of fun to the dinner table with this retro style Glass Salt & Pepper Shaker Set featuring easy to fill checkered glass containers with screw-on metal shaker tops. The nice heavy weight belies the affordable cost. Each shaker measures approximately 3 1/4" tall and holds 2.5 oz of salt or pepper. Comes packaged in a hanging box.